Anno 2010 has come and gone, and I think most of us are happier to see it going than we saw coming. On the Disney front, at least, things have been busy... if not exactly interesting. Walt Disney World spending has rebounded this year, even if overall attendance has dropped. Whether this is because of one of those odd cyclical patterns that all businesses go through or whether Universal's excellent new Harry Potter attraction up the street is drawing people away, Disney isn't saying. In fact, they're not doing much about it at all. 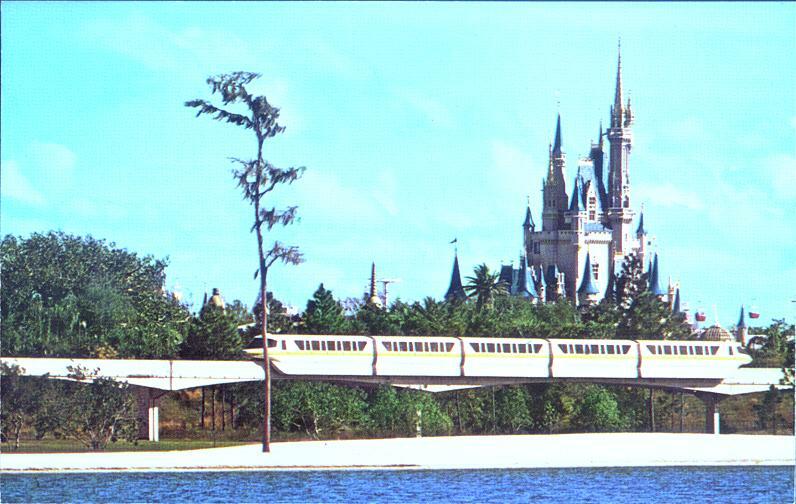 Now that a high-speed rail line is coming to Central Florida with a station on Disney property, the mass transit they're likely counting on to bring people in will also be able to take their business away, elsewhere. Things are changing rapidly in Central Florida and Disney seems to be counted on to be the last to respond. But this is a design oriented blog so I'm really not going to comment on that, especially and doubly so because so many people have spillt so much bandwidth this year doing so. So little has actually changed at Walt Disney World in the past 12 months that I did reconsider the necessity of writing this. Still, not every year can be a banner year, for Disney or for I, and maybe there's something to be said for a ritualistic year end tradition of unsolicited complaining. EPCOT Center did see some interesting additions this year and I will address those as well, and begin a new year-end recap of what happened here at Passport to Dreams. Hide the Women! Next-Gen is Coming! - The biggest thing to really happen in the Magic Kingdom this year was the tentative launch of "Next-Gen", which is a vaguely menacing prospect for those of us concerned about the aesthetic unities of this park since the introduction of FastPass ten years ago severely compromised many sightlines and obscured many themeing accomplishments with garish and badly placed directional signs. The little family plot outside the Haunted Mansion has, of of this writing, been totally torn out and WDI has moved forward with the construction of a next-gen queue which promises to be something like the "Boot Hill" area outside Disneyland Paris' Phantom Manor, and honestly if there is a bit more atmosphere in the works for the outside of this attraction, then it's sorely needed. 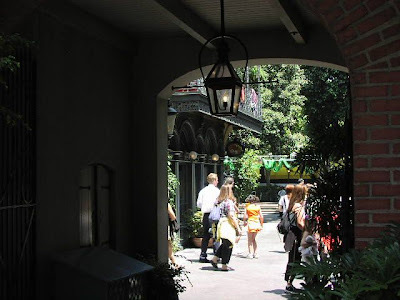 Ever since 1990 the Haunted Mansion's "atmospheric prelude" has been compromised by strange props and bad placement so that the house no longer truly feels separate from Liberty Square. Don't expect the strange red canopy to go away anytime soon but the new queue could end up something like the first areas of the Tower of Terror queue, so in my mind could be very good as a prelude to the show inside. At the very least, as an open air area, it will afford attractive views of the house, and the additional queuing space is badly needed. 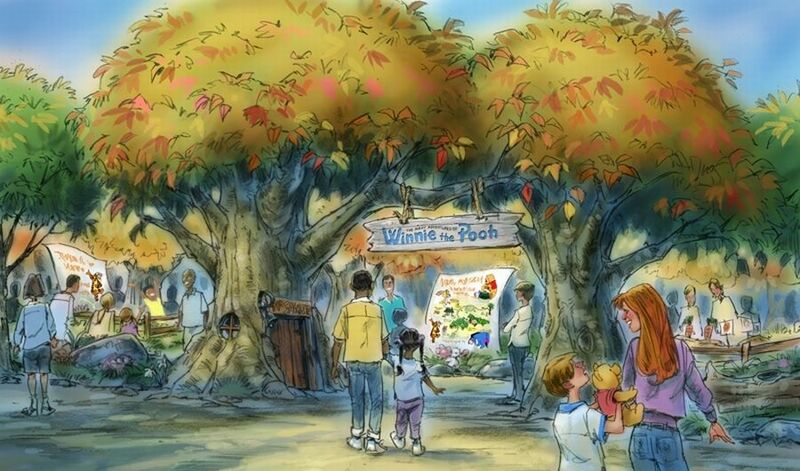 What has many people concerned is the promise-threat of interactive elements in this new queue, and we got a potential taste of what that could be like earlier this year when the fancy new interactive Winnie-the-Pooh queue opened. That queue was very well done but has the unmistakable atmosphere of a playground, which would certainly feel out of place outside the menacing Haunted Mansion. We should have faith that WDI, who have proven themselves to be fairly reliable for the past few years, will create something creepy and atmospheric instead of exuberant and playful. Indeed the Winnie-the-Pooh queue is so good that it makes a mediocre ride seem much better than it is, but I've already spoken extensively about this queue and how it fares surrounded by 1971 WED designs. Magic Kingdom: The Happiest Construction Zone of Them All - This was a bad year to visit Magic Kingdom if you don't like construction walls, because simply put, they were more prevalent than guests on some days. 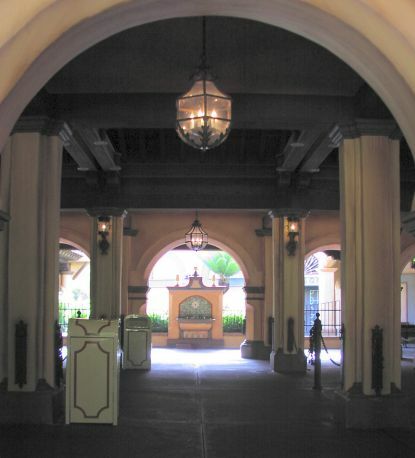 The Adventureland Breezeway bathrooms, particularly, were greatly reworked and expanded this year in a project which lasted an absurd five months. 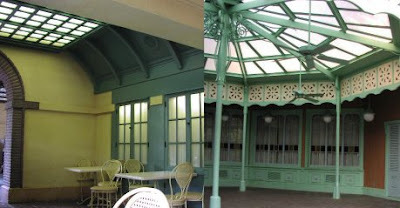 The net result of this is that the shaded veranda facing south near the bathrooms has been totally absorbed, which brings to an end a nearly 40 year run of what was once the furthest-flung seating for the Adventureland Veranda restaurant. In the process we lost some nice woodwork and an acceptable false skylight (see right, photo on left), but many of the original decorative elements have been retained and moved out towards the main walkway. This isn't really a tragic loss but it means that yet another quiet feature of the Magic Kingdom has been lost forever. 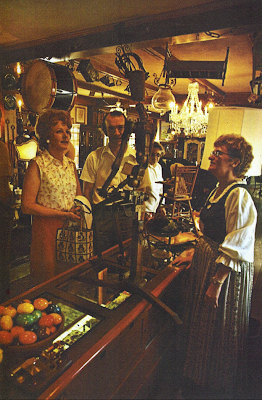 Those looking to be nostalgic may enjoy this 1990 video of the Veranda west veranda taken by Mike Lee, but let's be honest - it hadn't been this nice for fifteen years by the time this area was dismantled and filled with a bathroom, and the change is so subtle that many longtime Adventurers may not even have noticed. On the other hand, what were consistently the dirtiest and dingiest bathrooms in the park have been greatly improved, and this is a real improvement, not a rhetorical argument about the historical value of a minor pedestrian space. Other restorative work has been done around the park, including worthwhile efforts on Main Street and Liberty Square, and the old Round Table soft serve kiosk has been given a new thatched roof and a new name, both of which look very attractive. Last year I commented that the overall appearance of the park seems to be greatly improving, and the same holds true this year, which seems to indicate that at least a pattern is being established. I feel that some care has been taken to improve landscaping features, with many old trees in Liberty Square removed and replaced with new leafy ones, which greatly improves the appearance of the Square from the Hub. An unexpected series of freezes early in the year saw the removal of lots of old scraggy year-round weedish plants in Adventureland and replacement with aesthetically appropriate flowers, and a number of trees have come down which were formerly obscuring views of buildings. 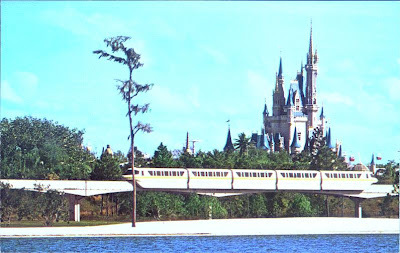 Somebody in horticulture or WDI has clearly noticed that the park looks very nice if you can actually see the buildings as intended in 1971, and this ranks as a massive victory in my book. Of particular historical interest is that the Gulf Hospitality House / Exposition Hall on Town Square has finally closed for an extended interior renovation which will remove both of the original Walt Disney Story attraction theaters and replace them with some sort of greeting area for Mickey Mouse. In a way this is a logical end for a show building whose use has been contested for as long as it has existed. When the front of the building was constructed in 1971 it was a facade for a hotel which never existed, and the facilities for the Walt Disney Story were actually built onto the east facing-side for the opening of that 1973 attraction. Over the years the space has been used for theme park preview centers, promotional campaigns and timeshare sales without really ever finding a satisfactory reason to exist, and if there's anywhere in the Magic Kingdom as it existed in 1971 in which I would approve of the permanent installation of Mickey and Minnie Mouse, the Hospitality House is it. Chief amongst the Magic Kingdom's many sins is the number of spaces walled up and neglected in the busiest theme park in the Western world. If Disney is ready to find a long-term use for this cavernous but neglected space, I'm ready to approve of it. So long as the interior sets for these meet and greets are tasteful and appropriate to the Victorian setting, this proves to be a significant upgrade for characters long relegated to garish cartoonish settings. 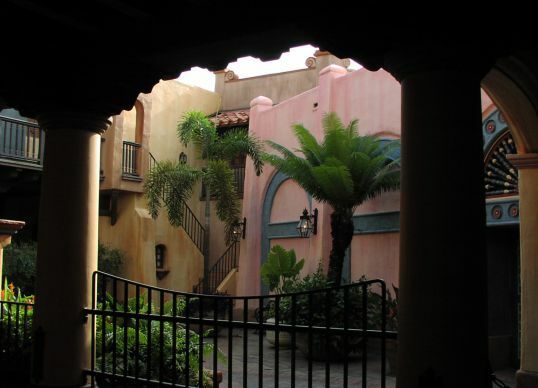 Cantina de San Angel Inn and Via Napoli - Moving over to the EPCOT Center, which for once got all the cool stuff this year, we find Disney investing in some new restaurants which pose interesting aesthetic challenges in relation to fitting in with the pre-existing thematic infrastructure. The longtime lakeside Mexican restaurant has been totally demolished and rebuilt as a double-purpose take-out and sit-down restaurant, and although the take-out food is quite tasty, it doesn't really impress from the outside. Make no mistake, for a double-purpose restaurant crammed into a tiny footprint it's fairly nice but the relatively unadorned side directly facing the original Meso-American pyramid makes more of an impression of being in a strip mall than a theme park. But the second effort this year, Via Napoli, across the water at the Italy pavilion, impresses. WED left the Italy pavilion unfinished back in 1982, and the lame back wall and open air on two sides made this painfully obvious. 27 years later, Disney has finished the job, and I find the effort admirable. The massive Via Napoli building, from across the water, looks just like it always belonged there, and the thematic work done leading from the former "back wall" of the Italy pavilion towards the front doors of the new structure has been carefully judged to appear a natural extension of the original work. Once inside, the restaurant helps to extend the feel that the pavilion continues off into some imaginary horizon line rather than terminating in a parking lot. Windows towards the east look out towards an original WED berm seperating Italy from the American Adventure which has been adorned with decorative trees and a gravel path, and it is a surprisingly effective evocation of some sort of Italian countryside. Tall half-round windows grace the back wall, but far above eye level, and look out towards a distant, again pre-existing line of trees. The backstage areas and parking lots have thus been cleverly screened out, but the treetops suggest a rolling countryside beyond the back wall which does not exist. The Power of Song, Imagination and Dance - And oh yeah, this ludicrous thing called Captain EO is back. 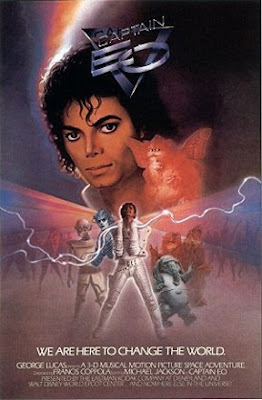 It's about Michael Jackson battling evil in outer space with his rainbow-beam hand lasers and a bunch of Muppets. Captain EO is sort of big news for us Retroists, and before I go into too much detail it must be first adknowledged that the return of this attraction was, and is, provisional. Of course Jackson died last year and this was a big reason for the return of this show, as was the overall poor attendance of the lame-brained, annoying Honey I Shrunk the Audience 3D show. That that attraction, based on a movie series nobody cares about anymore and which actually, embarrassingly took over the entire Imagination pavilion, has finally been laid to rest accounts for half of my enthusiasm for Captain EO. The other half is that I was surprised to find I actually liked it. Now nobody's going to mistake Captain EO for high art, but one of the reasons I find it so refreshing is that it is so unlike the bulk of cinematic product being extruded by Hollywood today. I grew up at the tail end of the height of the post-Lucas Hollywood, where big absurd fantasies with elaborate special effects sequences dominated the summer Blockbuster. Today when we look at a movie like Willow or Legend it seems outrageous that it was made at all, not only for the pure overachieving scope of the movies but the fact that at their core they're based around such simple premises. This is the Lucas doctrine at work and of course he had a lot to do with what's both good and bad about Captain EO. It is a cheerfully laughable film. So that may account for a lot of my positive reaction to the movie. I have no particular attachment to Michael Jackson or his brand of mid-eighties mischief, but here is clearly a personality who is a cultural force to be reckoned with, making a movie for teenagers at the last possible moment before youth culture went permanently ironic. It was directed by Francis Ford Coppola and shot by Vittorio Storaro, who ten years earlier had last been on a cocaine bender somewhere in southeast Asia making Apocalypse Now. EO can reasonably be slotted alongside Thriller from 1983 and Bad from 1987, both of which were also directed by major talents - John Landis, fresh off An American Werewolf in London, made Thriller an overambitious atmosphere piece and Martin Scorsese made Bad right before embarking on The Last Temptation of Christ. With beautiful miniatures by Industrial Light and Magic which look marvelous in 3D and bankrolled by Eisner-era Disney, this is a prestige attraction from another time. It may be a cultural dinosaur but it is as slickly oiled an entertainment machine as can be desired and in 3D, widescreen, and 70-millimeter, watching it it's hard not to eulogize a Hollywood machine which has totally abandoned this mode of entertainment. 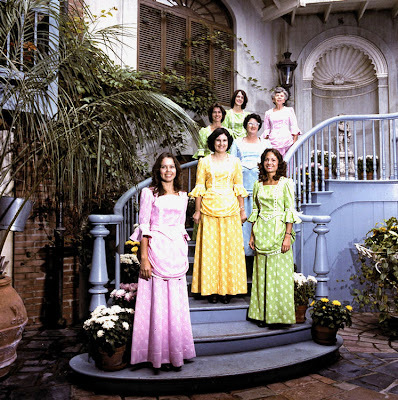 From a directorial perspective, Coppola's choices are appealing. Wide shots play in depth at the appropriate moments and the film is very well paced, feeling far shorter than Honey I Shrunk the Audience despite being about the same length. Storaro of course is an immensely talented cinematographer, and although I can't make any claim that either of these men took this project very seriously, their superior talent is up on the screen. Whoever was calling the shots on the 3D effects also clearly was patterning them on the more memorable moments in Magic Journeys, the Murray Lerner 3D picture which opened with EPCOT in 1982, which was ever stranger and freakier than EO. Fuzzball fluttering around recalls the children's kite from Journeys, EO's rainbow beams recall lightning being shot out of the screen by a witch, and even the beautiful opening shot of Journeys, a slow crane down through tree branches, is replayed in reverse at the very end of EO. It's also frankly a memorable piece of hokum. Despite having not seen the movie in at least eighteen years I never quite forgot the opening asteroid exploding in your face (at least as exciting as the similar 3D effect that opens It Came From Outer Space) or the memorably menacing Supreme Leader sticking her claws through the screen. This still is scary stuff for kids but it makes Captain EO's eventual triumph all the more pleasing. The cultural semantics moving inside concepts like transforming an H.R.-Geiger-knockoff-planet into a vaugley Greco-Roman paradise populated by choreographed dancers with Flock of Seagulls-haircuts are probably too bizarre and complex to unpack here, but it makes the film an honest and unabashed hoot. Would Disney today feel embarrassed to present audiences with a cuddy red Whatsit with butterfly wings who gets his own closeup during a musical number to sing "We are Here To Change the World"? Would cultural watchdogs today jump all over Hooter, a bizarre slobbish diminutive elephant wearing a wife-beater tee who throws food at the screen? 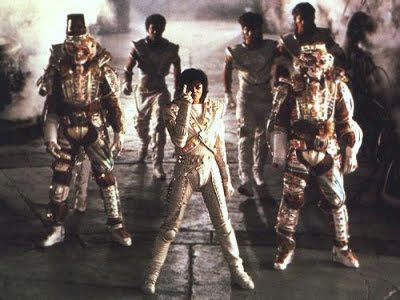 Captain EO is to be taken entirely seriously. COMMENTS: Walt Disney World needs to start working harder to maintain her standing in an increasingly competitive environment. Her Captain EO science project was great for her circle of friends, but does the rest of the class really enjoy it? "...might just be the most insightful culture and art writer I've ever read." I really have no idea what to do with praise like that, but I am very honored! 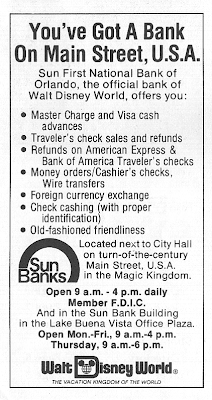 In other news, you'll notice I've also joined an Ad network, Main Gate, who advertise specifically for the Disney circuit and so far have proven to be reliable, amiable and excellent. One look at the list of bloggers served by Main Gate and you'll see that, aside from Passport to Dreams, they are all excellent resources and reporters. This also puts me in the hilarious position of having Walt Disney World advertising on my site at the same time I'm criticizing them. You may enjoy this however you see fit. 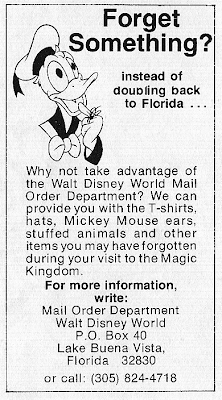 Please know that each click supports Passport to Dreams by subsidizing my otherwise financially crippling habit of buying old Disney World stuff on eBay, the same stuff that allows me to write history articles like those you see below. I'm not too proud to tell you this, so go ahead, click through and enjoy. I've much belatedly switched to a new Blogger template and decided that cream on navy blue is just a bit too much to ask for people reading my 15,000 word dissertations. I'm doing my best to make the template as memorable as possible, and now that I've got a new color scheme to play with, expect to see more of my signature silly rotating banners and more bizarre obtuse references to things nobody remembers. Take Your New Disney Friends Home! One if By Land, Two if by Sea... Now It's 1973! Special Thanks To: George Taylor, Michael Crawford, Mike Lee, Scott Otis, and everyone else who either listened to me blather or helped me get my info together enough to post. 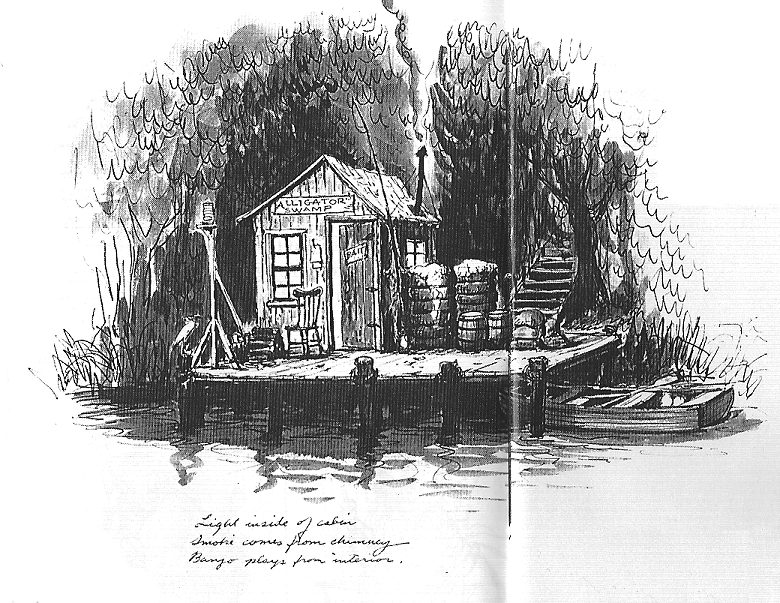 You Should Be Reading: Long-Forgotten, a Haunted Mansion blog that's way smarter and more interesting than I am. Thanks very much for being a part of my efforts here at Passport to Dreams in 2010 with all of your links, your discussion, comments, and support. It means a lot to me and see you in the New year! When I was young, most of my memories from Walt Disney World involved waiting in line. I can't speak for everybody, but I suspect most people would agree. I have stronger memories of the facade and queue of Mr. Toad's Wild Ride, for example, than anything that happened on the ride until about 1995 - I was totally fixated on those wooden cutouts of the Mr. Toad characters above the exit tunnels of the ride, and especially Mr. Winky, mostly because I had no idea who he was supposed to be. The Haunted Mansion, too, holds strong memories, for staring at the outside of that creepy old house wondering what could be inside is one of the most strongly inherited Walt Disney World memories for most children. And I'm fairly sure that five year old me remembered World of Motion more for the sweeping line of cars slowly ascending into the show building than for anything the ride was actually about. I bring all this up because the state of the themed queue - a Disney practice if there ever was one - seems to very much be in a state of flux right now. Less than a month ago (at the time of this writing) Walt Disney World opened her brand new "next generation" queue at the Winnie-the-Pooh attraction in Fantasyland. It is as fully accomplished as one could reasonably expect. Despite the small footprint, there is a very successful woodland atmosphere and some charming activities. Crawl through Pooh's house (much more fun than walking around it, by the way). Stomp on a circle and a gopher pops out of a hole. Turn a crank on a box filled with balls to make them jump around (while wondering what this has to do with the 100 Acre Wood). But honestly, it's all very nice. Indeed the removal of the "Renaissance Festival" theme is more of a relief than expected and there's some very elaborate sculptural work to tie the facade into the nearby Round Table restaurant. A new undulating brick wall visually links the area to WED's 1971 handsome brick planters encircling the Mad Tea Party next door, a master planning detail that shows somebody attentive to meaningful detail was at the reins of this project. Imagine - a new addition designed to effectively blend with 40 year old details - if only the 90's Tomorrowland reboot had had such considerations! 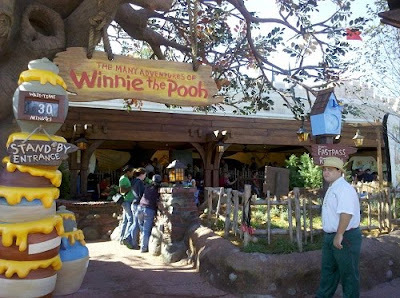 But for all that, let's be honest - there's very little in Imagineering's brand new Winnie-the-Pooh queue that couldn't have been done by WED Enterprises in the 80s. Nothing in it seems much higher tech than what we could play with in the original Image Works back in 1983, several generations of ride design ago. And I don't mean this in a negative way - I think it's the secret to the new queue's success, why so many people who are ordinarily quite hard to please have lined up online to praise it, myself included. This is a brand new addition to the Magic Kingdom, a park in which newly designed rides sit alongside patently old-school theme park experiences like the Swiss Family Treehouse, or attractions which have been basically unchanged since opening day have been given a few new special effects to seem fresh again. A totally high-tech new queue would seem out of place sitting five feet away from the Mad Tea Party, which has been basically the same since 1972 and itself is descended from a Disneyland original from a half century ago. But that doesn't exactly make a great case for this new fancy gee-whiz queue being very "next-gen", a word which is being bandied about wildly online (and, presumably, inside Disney) a lot these days. 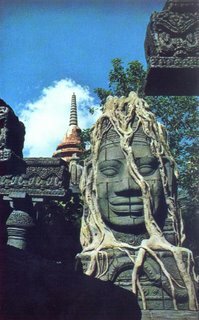 In the Indiana Jones Adventure, itself an attraction closing on fifteen years old now, there is a throw-away gag in the queue where you can pull on a rope and drop an unseen archeologist into a pit below. It's a very low-tech audio gag that Bob Gurr could have worked up in 1955 with a lever and a reel-to-reel tape, and really nothing in the new Pooh queue is much fancier than it. But that is just one moment in the long Indiana Jones adventure queue line which is more about shadows and atmosphere than interactive gags. This new Pooh queue is a different thing entirely - it's nothing but interactive gags, dozens of ropes and archeologists - it is a constant and uninterrupted playground. Of course this is placed in front of an attraction aimed at young children, so it may be too early to chalk Walt Disney world Next-Gen Queue initiative up to being Pooh's Playful Spot Due. But what is this brave new world of waiting in line that we're promised? It is recieved wisdom that Disney invented the switch-back queue. There is no real reason to doubt this but no real way to prove it either, of course. 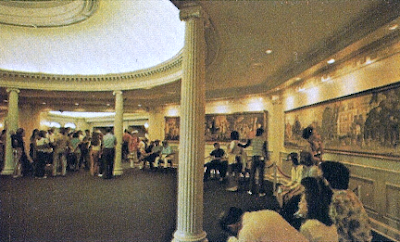 As far back at the late 60s and early 70s one can find Marty Sklar talking about the innovate use of queues to make the wait in line go by faster, and one can define the very original, the very basic Disney queue as a long switchback working from front to back while approaching a painted wall where the load point is. The mural behind the loading area of course is as old as the dark ride itself, dating all the way back to the Pretzel Amusement Company's earliest efforts. 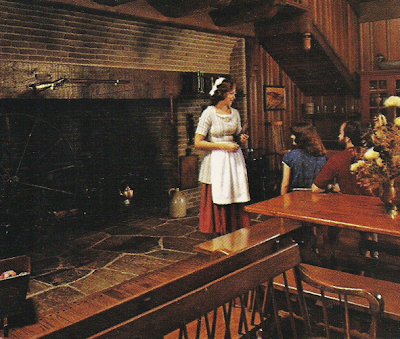 In this way we can see an attraction like Snow White's Adventures as being directly descended from the classic midway Laff in the Dark, even while the Disney versions dramatically altered the way those later dark rides were built. 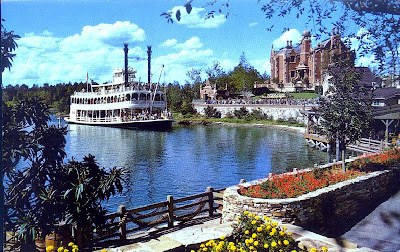 Disney's main innovation and departure in 1955 was to replace the traditional "back wall" with, in fact, no wall and a beautifully designed manufactured landscape. Trompe l'oeil becomes terrain, the "scenic switchback". 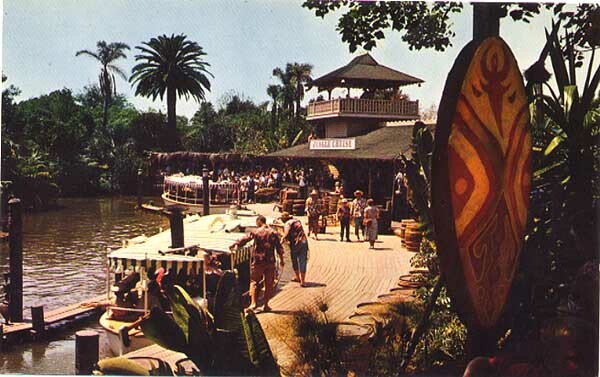 The earliest example of this may be the Jungle Cruise, but I think the most beautiful one is the Matterhorn Bobsleds, which is an exciting, fascinating wait in line by virtue of... yodeling music and manufactered rocks. But for all that, honestly, we don't think of Disney's best queues as being plain switchbacks, even if they secretly are. If we cut the roof off the Florida Pirates of the Caribbean queue and look in, we'll see that the switchbacks are unpredictable because they wrap behind walls and around scenes, they're actually pretty much just like what still graces the front of Snow White's Scary Adventures (see below). 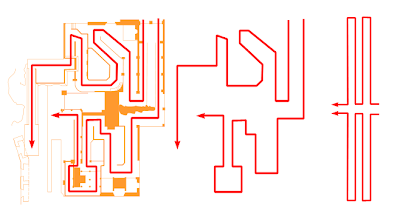 Even the beautifully linear Space Mountain and Indiana Jones Adventure queues eventually reach switchback areas, just not immediately or obviously. These queues, the "secret switchbacks", are a later innovation on the part of Disney and are what is generally thought of as the "themed queue", atmospheric treks which set up some component of place or atmosphere, indicators of an advanced state of themed design. 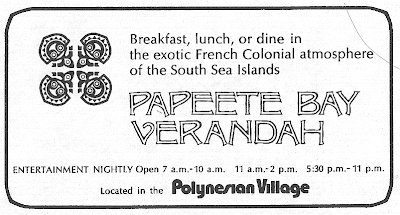 In the context of Disney-designed attractions, this mode was more or less invented for the Florida Pirates of the Caribbean, although Disney did not always use it for every attraction. 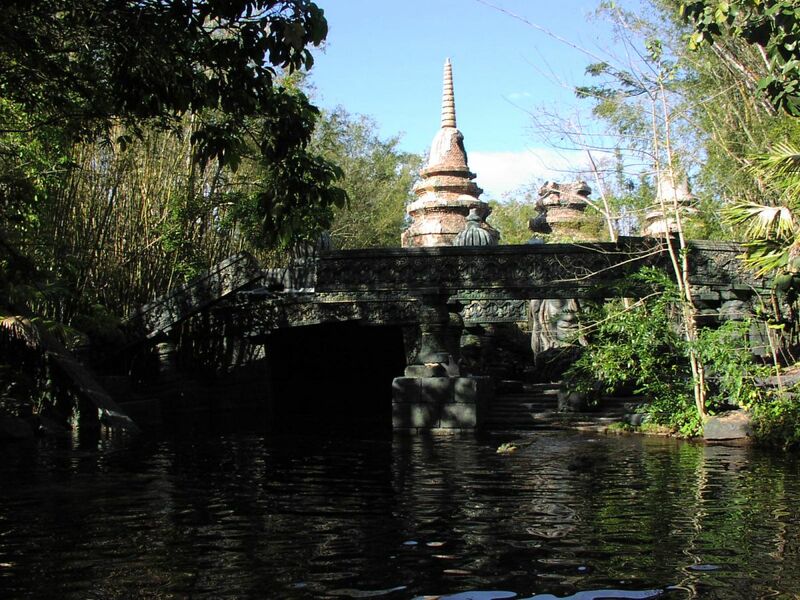 Big Thunder Mountain Railroad, for example, is more or less a simple "scenic switchback" queue, at least in the original design of the attraction (built in Florida in 1979). 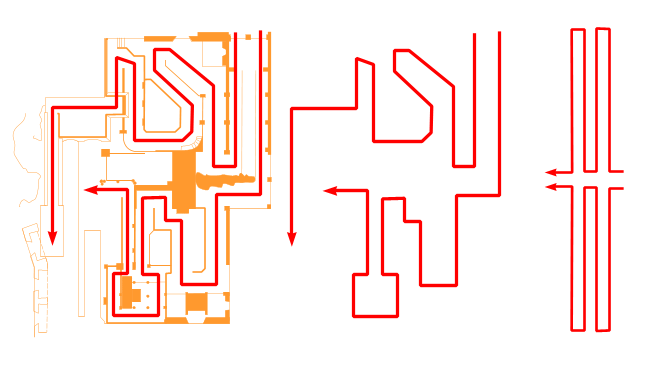 The ultimate example of the "secret switchback" is the Florida Space Mountain of 1975, which perhaps may be the single queue which most deserves the title of "pre-show". When WED designed the attraction they placed the loading point for the roller coaster at the far end of the Space Mountain show building, and the truly epic winding queue to get there is one of Walt Disney World's true glories. It was originally designed to serve as a product exposition of sorts for the RCA corporation, although a 1985 refurbishment (confusingly called "RYCA-1: Dream of a New World") removed much of the apparent reason behind all the windows and scenes. 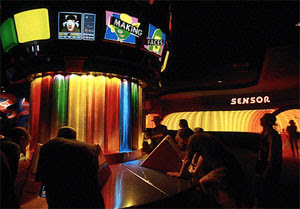 Still, as originally conceived, this is the only queue Disney ever built that I know of where guests were encouraged to enter just to see the pre-show RCA displays and post-show RCA Home of Future Living even if they did not wish to ride the roller coaster, and could do so without surrendering an E Ticket. It's simply a beautiful, expertly executed experience, and the real world seems to fade away slowly as we descend into the perfect dream state. The surrender is so complete that nobody ever seems to notice several significant logic gaps which the queue sees no reason to explain, but rather leaves mysterious. How, for example, do we end up in outer space? It's just there, at the end of a hallway, as if outer space could be on the other side of any ordinary door. But the immersion into the dreamscape is so total that the neccesities of the typical approach become unnessicary, uninteresting. 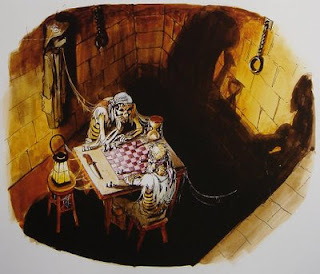 Think of the way Pirates of the Caribbean establishes (with a show facade or front) the ostensible location of the action of the attraction before it goes about slowly pulling you into the supernatural night-scape, slowly introduces the world you will be inhabiting. 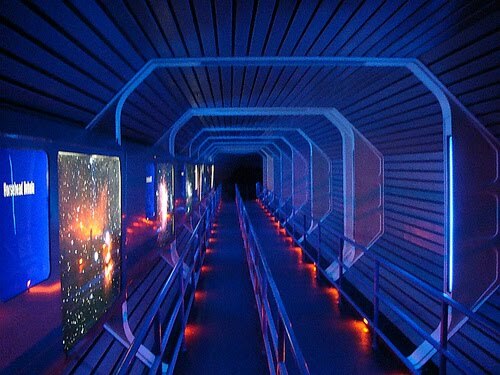 By comparison Space Mountain is the supreme act of confidence: are you in space, or are you not? The show never seems to decide, staging open windows into starscapes, weird "launch" rooms floating in the cosmos, and other eccentricities with expanded-consciousness 70s casual ease. Compare this to John Hench's earliest form of the Flight to the Moon attraction in 1955, which went to extreme lengths to make the illusion of boarding a flight into outer space convincing, including a "spaceport" holding area and a corridor simulating a telescoping tunnel into the rocket nosecone. Space Mountain may be all flash and flare, but what glorious misdirection it is. 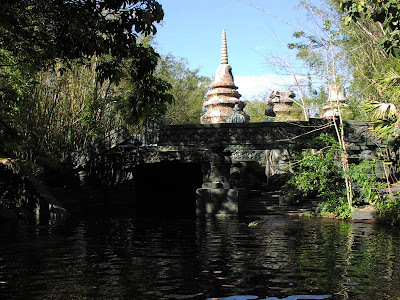 In 2010, a Disney-style "secret switchback" queue opened at the Islands of Adventure theme park in Orlando, and it is one of the very best ever. The queue for Harry Potter and the Forbidden Journey is literally the best part of an already brilliant attraction, and has immediately required use of qualifiers in this article about Disney queuing spaces. It is so good that it makes the actual onride experience, which is a clever use of provident sets to link animated creature figures and projected images, seem much more real and tangible than it really is. 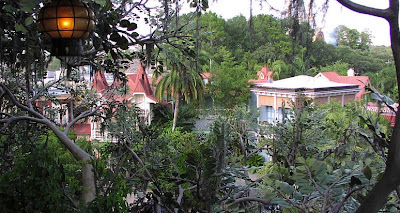 The Haunted Mansion, similarly, conjures up an ethereal "house" out of painted walls and suggestive darkness and so we think there's more there than there really is, but we believe the house is really there because we've seen its' exterior. It's hard to not be fooled into believing that there is a real interior inside a solid looking exterior house or facade, or a real room behind a solid-looking door. Harry Potter and the Forbidden Journey achieves the same effect with a convincing miniature Hogwarts and an awe-inspiring, overachieving queue, and so can be seen as an important lesson in the effect a prudently-designed queue can have on the ride itself. But that queue is essentially a perfected version of the Disney model, similar in many ways to the texturally magnificent Indiana Jones Adventure, with much of the same sense of awe. Details peek from unexpected niches and magnificent, fleetingly glimpsed tableaux are tucked into obscure corners. The only distraction is the convoluted plot being conveyed throughout, but this is of course a Disney offense as well. The keystone of the "secret switchback", the "themed queue" is that although these waiting areas disguise their true purpose with entertainment, atmosphere and mystery, they feel essentially linear although they are not. We feel lost in the Castillo del Morro or the Temple of Mara, we tour the various rooms and classrooms of Hogwarts, but the net total of the ground we've actually covered is very little. We twist and turn back and forth just like outside Snow White's Adventures, but the special accomplishment is a feeling of linearity. This brings us all the way back to Pooh and Friends in the 100 Acre Wood. 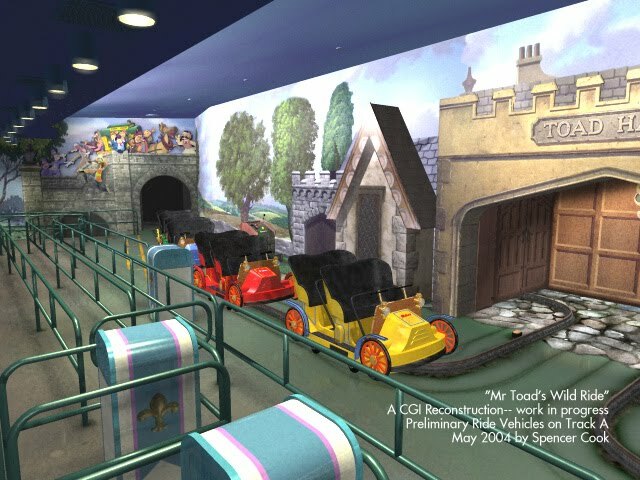 While there is nothing particularly special about the layout, theme or even conceptualization of Disney's new "third generation" queuing experience, the sense of distraction has now reached a zenith. There are constant amusements, from bizarre suction-cupped sunflowers that click when they are turned to unusual water features scattered throughout a well-themed landscaped terrace. It's foolish to compare this to richly realized special acomplishments like those queues at Tower of Terror or Harry Potter and the Forbidden Journey, but it does indeed feel like something original being formed before our eyes. 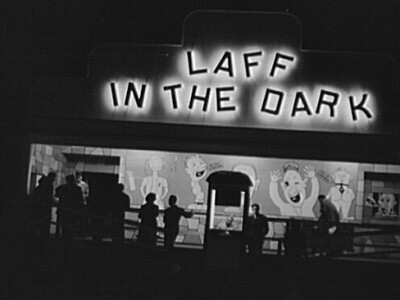 The issue of entertaining patrons while waiting in lines has existed for as long as there have been attractions, and early showmen used "Laughing Sals" or carnival barkers to draw attention and pass the time. 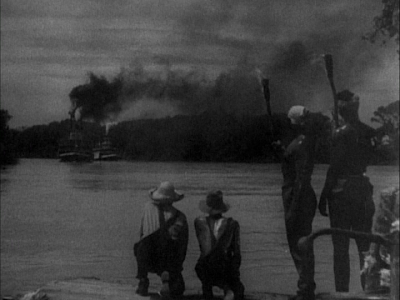 It's unlikely that Leon Cassidy ever imagined children stomping on platforms to cause gophers to pop out of holes would ever grace the front of a dark ride, but in an era when patrons are more likely to look at handheld video game systems or cell phones than any measure of delicate and beautiful themeing, a compromise must be made. Disney is leading this charge. In the queue of the future, everyone smiles a lot!!!!! I shall call these "super switchbacks". The emphasis is not on illusion but distraction, constant amusement, limitless pleasure. You aren't just waiting in line to get on the attraction, the attraction is already happening to you as soon as you walk near it. The effect this will have on future themed design is difficult to gauge at this early point, but the effect on this particular ride, The Many Adventures of Winnie-the-Pooh, at the Magic Kingdom in Florida, is easy enough to assess. For the first time ever I had a good experience with the ride. The increased atmosphere outside obviously helps, but because I stomped on a circle to make a gopher pop up and turned a bizzare sunflower, the ride's many flaws - cheapness, tiny scale, general confusion - seemed less important than the cumulative effect of the entire experience, from door to door. This is a smaller scale version of the effect Universal Creative accomplished with Harry Potter and the Forbidden Journey, although of course the ingenuity of the two attractions is not comparable. If the "super switchback" can make me want to experience again a twelve year old attraction I'm inclined to dislike, how will it affect the experience of an already superior attraction? 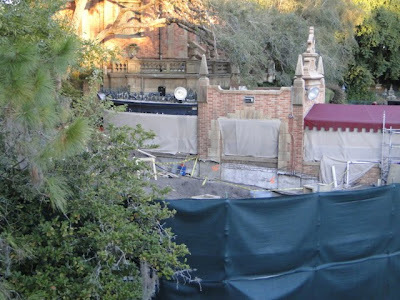 Will the hushed, funeral atmosphere of the outside of the Haunted Mansion suffer? Can such a concept encourage patrons to get into the screwy mood of the Jungle Cruise? This could become a massive sea change in the way we experience theme parks. Disney is prepared to drop a billion and a half dollars to find out. As Margo Channing would doubtlessly advise, it's going to be a bumpy ride. It all started with... Marty Sklar, believe it or not. 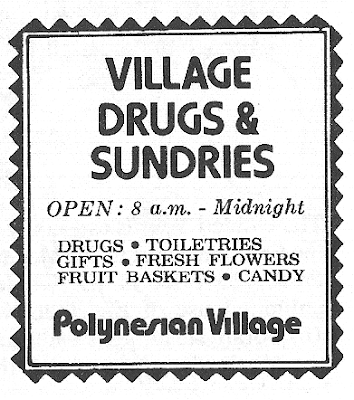 "The original summer, we sold 75,000 copies of the Disneyland News at ten cents. That was what Walt wanted. 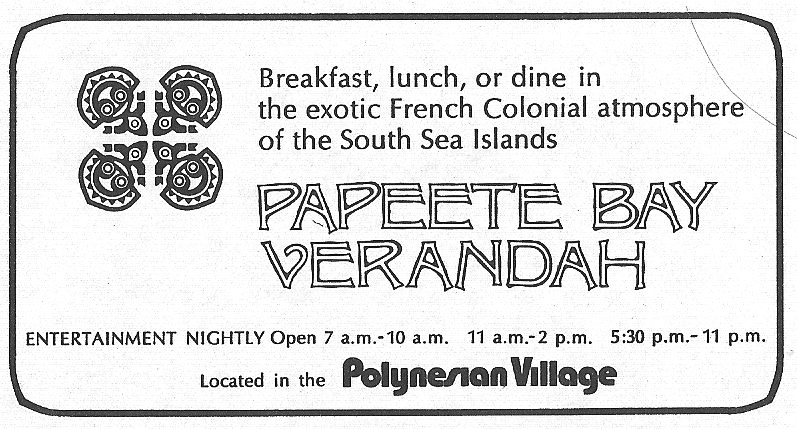 He wanted people to have it, and to get the world out about Disneyland, so ten cents was the price. 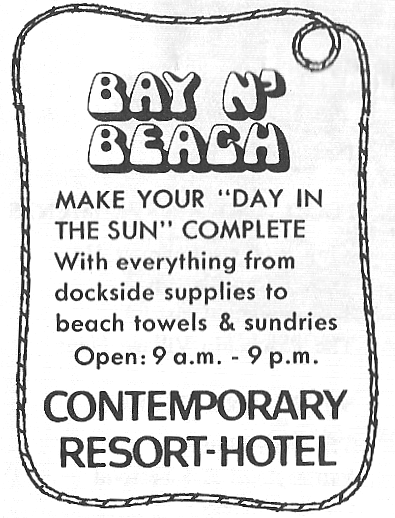 [...] The newspaper was initially used and distributed to motel and hotel operators in the Southern California area, and then we decided we needed something a little slicker than that. That's how the Disneyland Holiday magazine came about, and we broadened that out and distributed it to Arizona... to anyplace that was within a day's drive of Disneyland. We started the Disneyland Holiday magazine, and then when Holiday Magazine threatened to sue us, we changed the name to Vacationland Magazine." Our article today does not focus on Disneyland publicity, but in this story we can see the seeds of the Walt Disney World publicity machine coming into being. Walt Disney World did indeed open with editions of Walt Disney World Vacationland magazine, and it was distributed throughout the southeast -- I have one stamped "ST. PETERSBURG KOA" and each issue featured advertisements from local area attractions such as Busch Gardens and a Disney-penned article about places and things to see in the Florida area, such as Tampa Bay's Gasparilla festivities or Old Key West. The back page of every issue was a full page ad for Cypress Gardens, an attraction Disney would help put out of business 35 years later. 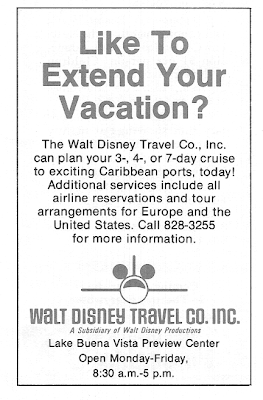 So Walt Disney World Vacationland was directly descended from Disneyland News, but perhaps surprisingly, Disney would also print a promotional newspaper - not for external circulation, but internal - and this time, it would stick around for some twenty years. 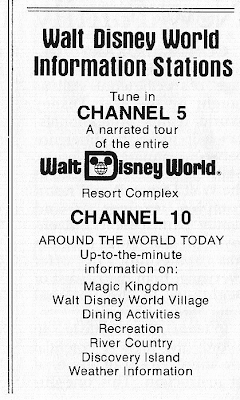 Walt Disney World News, as it was initially called, was a basic but richly detailed four or eight page "periodical" published once a month, detailing what to do and what to see around Walt Disney World. 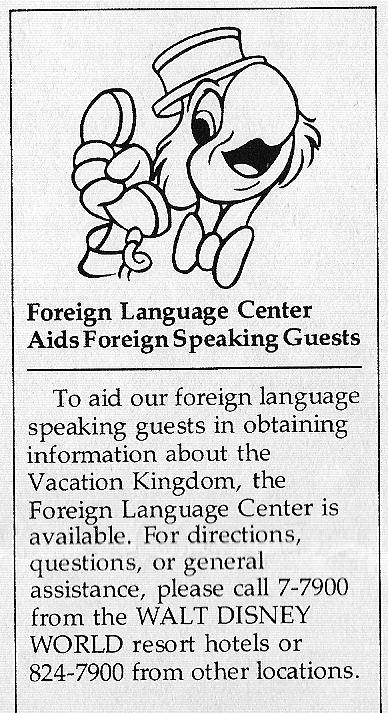 It was distributed to hotel guests in their check-in folder and also to Magic Kingdom visitors at City Hall and the Gulf Hospitality House, and may have in fact been the first ever Magic Kingdom guide map, as the familiar GAF guides did not begin publication until 1972. The center of Walt Disney World News issues featured a luxurious two-page spread on the Magic Kingdom, her attractions and facilities, and a very large map. In a way this was a smart idea because one cannot go anywhere near a Walt Disney World News without absorbing an enriching wealth of detail, and being forced to leaf through a newspaper to find your way around a theme parks means you're going to be thumbing past pictures and text about recreation, golf, the Contemporary Resort and the Polynesian Village, and in those early days Disney was especially concerned about getting the world out about all the other great things in Walt Disney World beside the Magic Kingdom. One of the great treasures of these publications are the faux ads, comic strips and assorted silliness they featured on a regular basis for the first ten years, either as "ads" or just strange asides to the reader. So let's turn back the pages of history and flip through some of Walt Disney World News' highlights. And of course no look at the first ten years of the publication would be complete without an opening look at the headline itself. 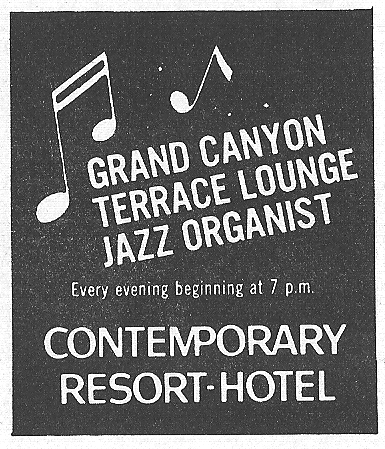 This classy, original logo was the very first (you can see this comes from Vol. 1 No. 1 in the lower left there) and persisted until at least late 1975. Long before color invaded the newspaper in the mid 80's, Walt Disney World News was printed in a restrained dual-color system, black and white text and grey scale photos with a bold splash of colored headlines, the color changing each month. 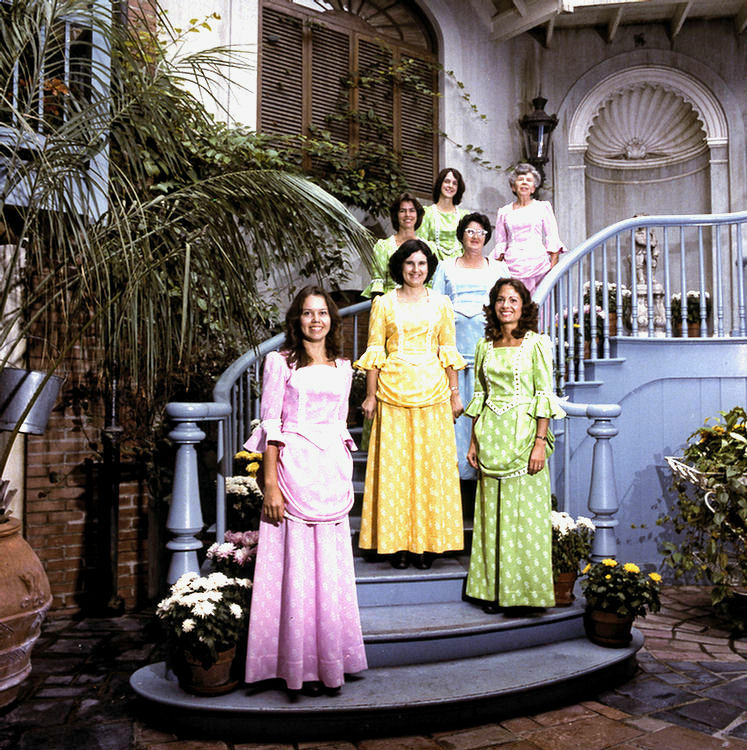 February 1972 was light blue, for example, and July 1972, shocking florescent green. It was tasteful, restrained, attention getting and pleasing. This strange interim version lasted only one year - 1976 - but the new name, "World News", would be resuscitated for use in the mid and late 80's. 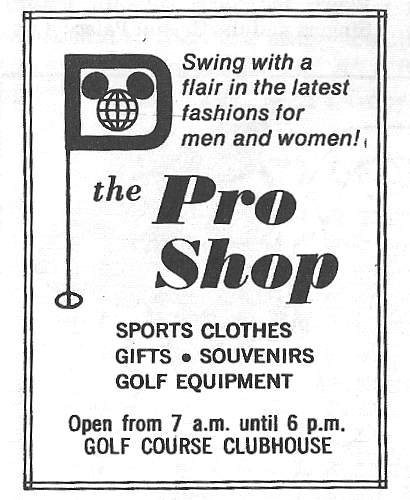 This logo closed out the first decade, from 1977 to 1981. 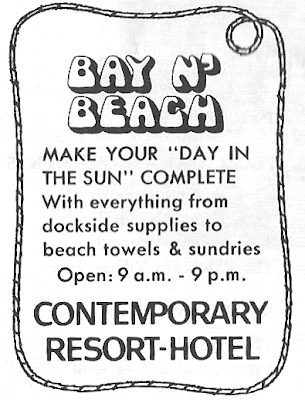 ...before becoming this, for the resort's "year-long, smile-wide" (ugh) promotion. 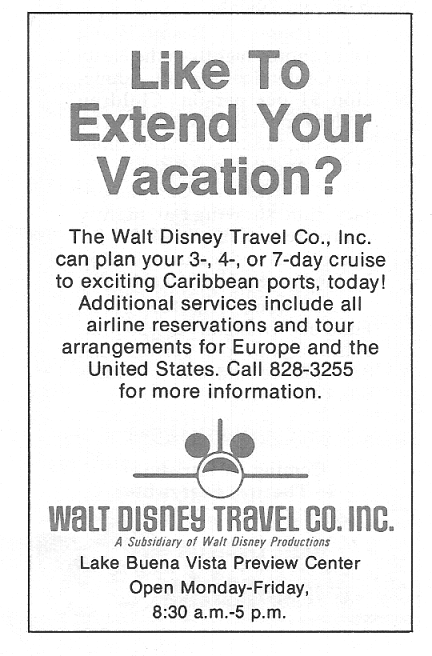 The Walt Disney World Tencennial, by the way, is probably Disney's best ever Disney World promotion, because it lasted an actual 12 months and ended with the opening of EPCOT Center. This was back when the Pro Shop was stranded way out all by herself with the Palm Lounge and Magnolia Room in the Golf Clubhouse, years before it was expanded into a hotel, and so may have needed all the advertising she could get! And don't forget to buy your daily Fruit Basket at the Polynesian Village. Mahalo! 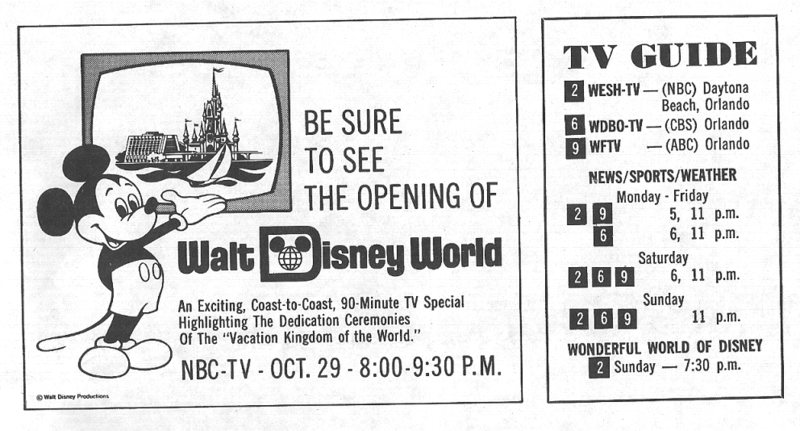 ...and an opening day television listing and advertisement brings the 1971 WDW News home. 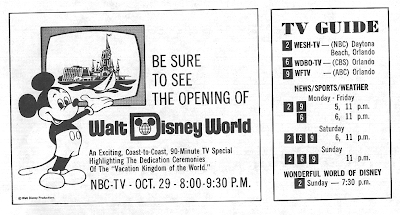 I love that that Wonderful World of Disney gets her own section of the television listing. The idea of watching that splashy, bizarre 70's intro to Wonderful World of Disney in the comfort of your brand new Polynesian Village room, Cinderella Castle glittering across the Seven Seas Lagoon, is my idea of paradise. Maybe in a former life. 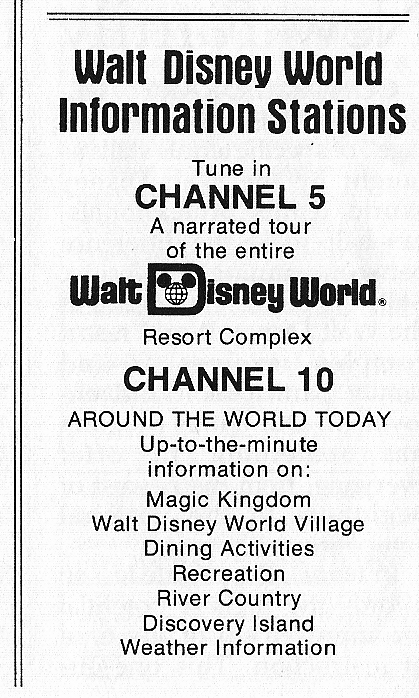 These glorious and exciting advertisements come to us from a June 1975 Walt Disney World News. The color that month was a pleasant pine green, as can be seen. 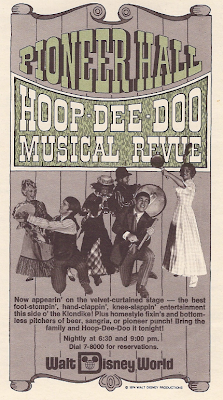 I can't think of a single better sell for the Hoop-Dee-Doo than we have here. In fact, it makes me want to go see it right now. It's 1976 and things are aqua blue as the cool guy with the sunglasses attacks us because we haven't yet been to the Contemporary Racket Club! I don't know who those "Pros" are we see above us in the Golf Resort ad, but I do love the tag line "And challenging golf. For you and the pros. At the Golf Resort." Since we learn in this issue that the Trophy Room now features fondue there's a double incentive to go. "But the Magnolia's most awesome 'monster' is number 17, probably the toughest hole of all of the Walt Disney World courses. This par four beauty has frustrated scores of pros and ameaturs alike. The tee shot, past water on the left and a virtual jungle on the right, must be a long straight ball." Murph: Walt Disney World's greatest forgotten character. 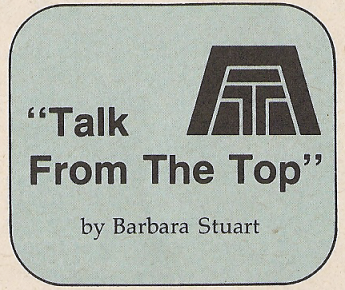 Below is the byline for "Talk from the Top", a monthly article detailing who will be performing at the Top of the World supper club and when. This makes for strange reading for those of us 35 years later who are not primed to recognize names like Marilyn McCoo or Buddy Greco. 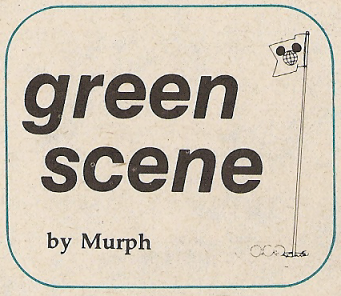 This feature had been running in WDW News since the very start, but for some reason in 1976, and only in 1976, is it a "column" complete with a byline. It's anybody's guess if Barbara Stuart really existed! 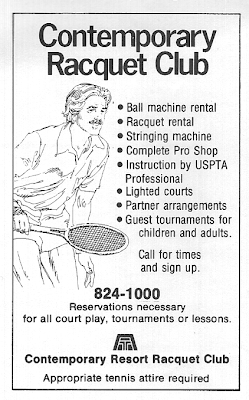 April 1978 brings the handsome 70's-looking-guy at the Racquet Club, the soon-to-be-ubiquitous "Like To Extend Your Vacation" ad, and a very nice look at the "Sun Banks" logo, now Sun Trust. 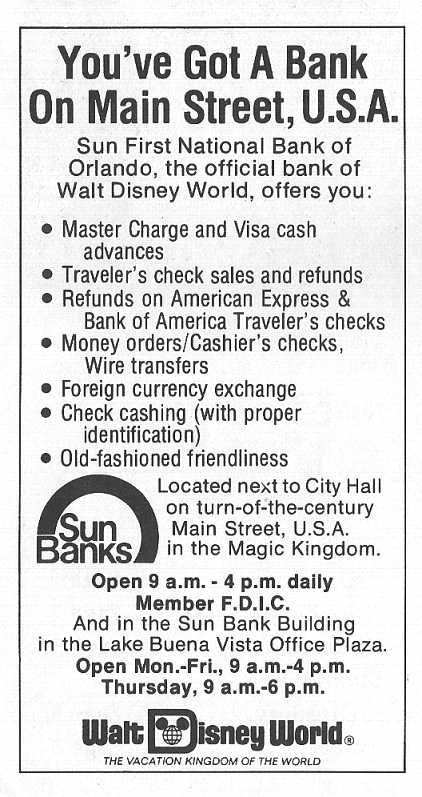 Sun Banks' building across from the Walt Disney World Village was brand new back then and today survives as a rare unchanged pocket of 1970's Disney goodness. I've always found this drawing of Jose to be fascinating, perhaps because he doesn't seem to actually be speaking into the phone. This ad is reprinted in French and Spanish directly below the English text I've scanned here, by the way. 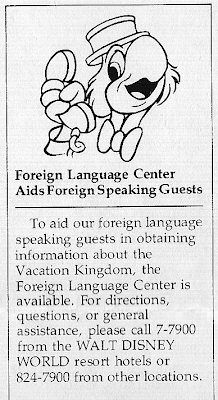 In 1982, Disney put the French text above the Spanish. 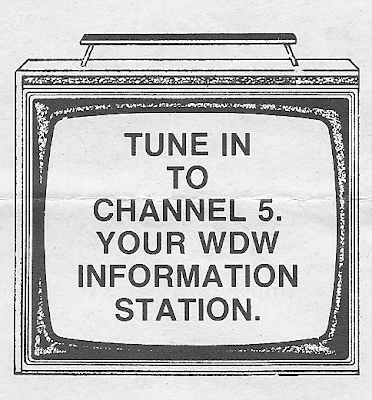 And the 1982 WDW Information Channel listing brings home our brief tour of the first ten years of Walt Disney World News. Of course it's only the smallest taste, not representative of the wealth of detail, information and evocative writing these wonderful time capsules possess. 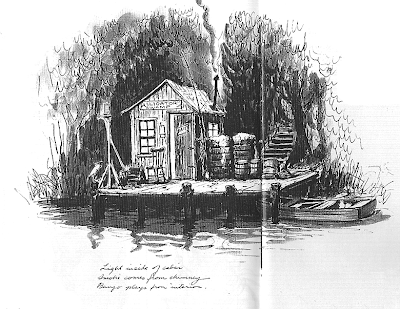 Still, I hope it whets your appetite for more or just provides a look into the distant past of Walt Disney World, an echo of an era that seems more remote with each passing day.